There are a lot of reasons we were excited to be invited to the first of three dinners to celebrate 62 Restaurant & Wine Bar’s fifth anniversary. First, it promised to be a fun night of reminiscing on five years of success and how it came to be. Second, we have never forgotten how Chef Tony Bettencourt bravely led the way to a local food renaissance when he opened a fine-dining restaurant at a time when the North Shore was known only for pubs and clam shacks. The third reason, of course, was the food. And it did not disappoint. The theme for the dinner was inspiration—dishes that reflect the journey that Bettencourt took from restaurant work and culinary school to ultimately becoming a chef/owner (with a six-year detour into truck driving, of all things). The first course was a delightful, varied antipasti with house-cured salumi, roasted beets topped with sea salt, pickled mushrooms, and sweet and sour cippoline onions. While we sampled, Chef Bettencourt told us about the early days of his journey, ending with an unexpected shift to Italian food (he had trained almost exclusively in French cuisine). From a photo he saw of an antipasti table in a trattoria, he began his journey into a cuisine he adores and works every day to master. Next was the pasta course, harking back to a meal Bettencourt and his wife ate on a culinary tour of Tuscany. Both the tortelli di patate and mushroom tagliatelle were spot on in terms of flavor and texture. We then received an extraordinary seafood dish that Bettencourt described as his twist on fennel citrus salad and reflective of the way he likes to cook now. Shaved fennel was topped with green olive tapenade, crispy prosciutto (house made), a perfectly seared sea scallop, and a spicy pickled grapefruit segment. Not only was the grapefruit a completely new sensation (spicy? grapefruit? ), but the various elements came together to create a perfectly balanced dish. The meat course consisted of house made garlic sausage, hanger steak thinly sliced and topped with salsa verde, and pork ribs over roasted fennel and potatoes. All three elements were extraordinary—so full of flavor and melt-in-your mouth tender, especially the rib. Bettencourt again explained that his style is to bring out the flavors of food rather than overwhelm them with sauces or extraneous components. 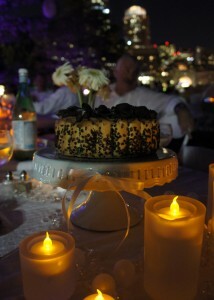 We ended the meal with tiramisu, once again with a twist. Rather than a layered dessert served as a rectangular slab, this was house-made ladyfingers completely saturated with espresso and rum topped with a delectable mascarpone cream sauce. Yes, we’ve all had our fill the ubiquitous tiramisu and, no, none of it tasted like this. The best news about this dinner is that it’s the first of three in a celebratory series. The second dinner takes place on Wednesday, February 20 and will feature dishes from 62 Restaurant & Wine Bar’s very first menu. The final meal is Fan Favorites, on March 20. Diners are voting now for their favorite dish from the past five years on Facebook, and the winning dishes will appear on that evening’s menu. The dinner is $62 per person, not including tax or tip. Learn more about the dinners and information on reservations on their website. 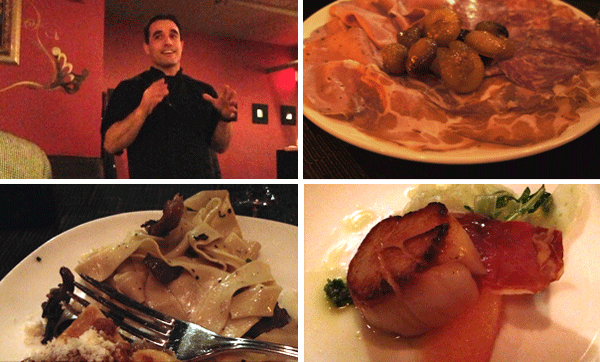 Chef Bettencourt’s five-year anniversary made us realize that we launched North Shore Dish just over four years ago. Boy, has the North Shore restaurant scene blossomed since then! Happily some things haven’t changed: one of our earliest posts described a fantastic dinner we had at 62. The Beverly restaurant scene is shifting rapidly, and we were thrilled to get a sneak peek at the new restaurant going into the space held by Mandrake. We were quite fond of Mandrake, but having seen the interior and the menu for Barrel House American Bar, we’re even more excited by the newcomer. A barrel house is a room for aging whisky, and American Bar refers to the American bartenders who set up shop in Europe during prohibition. Thus, the new spot is an American bistro with a neighborhood feel and an emphasis on classic and craft cocktails. It’s owned by Nik Paras and Anesti Lazarides (of Soma and Wrapture) and Sean Maher (shown at left), formerly bar manager at Tryst and now managing partner. We loved Sean’s work and are excited to have him back on the local scene after a stint at Eastern Standard. The chef is Patrick Shea (of the Tom Shea family), also recently of Eastern Standard. We saw the space under construction, but with the windows cleared of curtains, a new tin ceiling, and a beautiful 20-seat cast-pewter bar, it looks cozy yet hip. When you belly up to the bar, you’ll have local beers and interesting wines to choose from, along with the aforementioned cocktails made with craft spirits, fresh purees and juices and the appropriate ice (think crushed or unique cubes). You may also want to partake of the raw bar, the house-cured charcuterie, a few chef-selected cheeses, or bar snacks like truffled parmesan popcorn and foie gras stuffed cherries marinated in sweet whisky. At the nearby banquettes and the 22′ family table made from reclaimed boards (from the First Baptist church recently moved in Salem) you can sample small plates or go right for comforting entrees like mac & cheese, baked haddock, steak frites, or mustard seed encrusted Scottish salmon. Entrée prices run from $18 to $32. 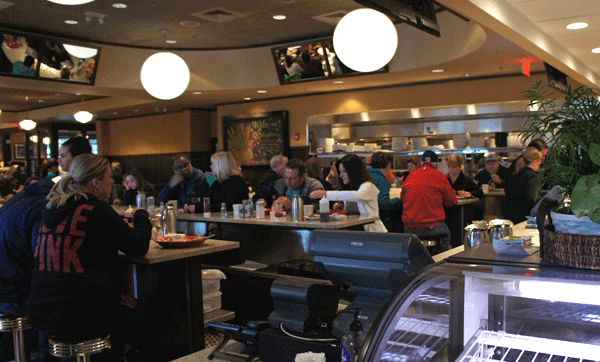 Having been to Red’s in Salem on many lazy Sunday mornings, we were excited to check out their latest incarnation in Peabody (on Rt. 1). It’s an enormous space but quite welcoming, with diner-style counters up front and family-style tables elsewhere, plus a nice-looking bar. We arrived around 12:30 and were a bit disappointed to learn that lunch is not served on Sunday; the restaurant moves right from breakfast to dinner (starting at 2:00). Unlike their sister restaurant, this location serves alcohol and is open until 10pm Sunday through Wednesday and 11pm Thursday through Saturday. Nonetheless, we ordered up some of our breakfast favorites and thoroughly enjoyed them. The pancakes have got to be one of the best deals around, with three platter-sized fluffy cakes for $6.25. We had the chocolate chip, but the blueberry and banana are also delicious. 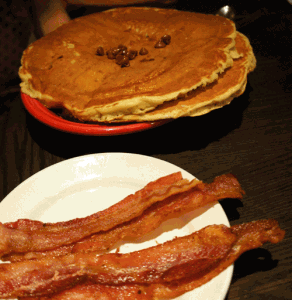 Served with a side of bacon or sausage ($2.50), it’s enough food to last until bedtime. 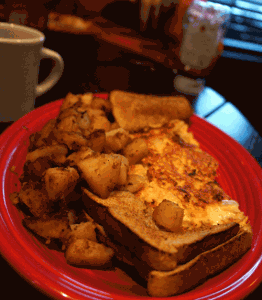 Two eggs with thick-cut Canadian bacon, home fries, and rye toast also hit the spot ($6.50). The home fries are crispy outside, soft inside, and well seasoned, without being too heavy on the salt or garlic. Like just about everything on the menu, the omelets are a great value: a huge portion of eggs with generous fillings. 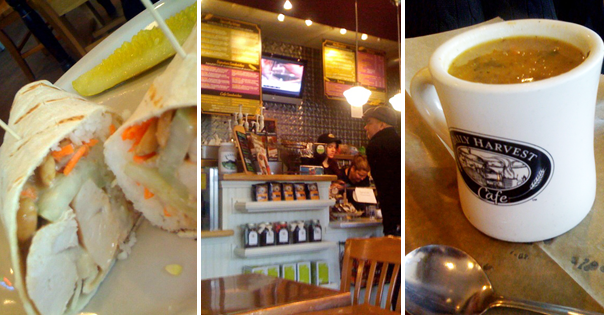 We enjoyed the tried-and-true Western with cheese ($6.25) and the more unusual fresh spinach with feta ($6.25). You can create your own concoction from a variety of ingredients and cheeses. Unfortunately, the breakfast specials that day sounded great and were sold out when we arrived. Guess we’ll have to get up earlier if we want to sample the lobster benedict or one of the other benedict-style offerings. We managed to make do with a respectable waffle ($5.50), bacon, and a tasty Absolute Bloody Mary ($9.00). The Sunday dinners we saw on the tables as we left looked tempting, so we’ll definitely plan a return trip to try the chicken pot pie ($9.50) and the rib-eye steak ($24). Wine lovers, it’s time to grab a jacket and get out to one or more of the fantastic wine festivals coming up in the next three weeks. And yes, there will be cheese. 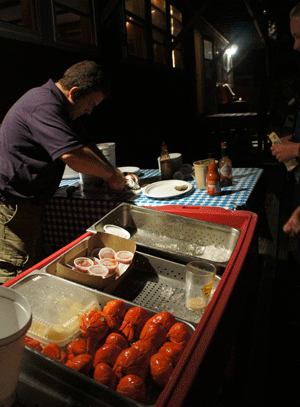 First up is Shubie’s Annual Wine & Food Festival, this Saturday (Oct 20) from 1:00 to 5:00 in Marblehead. 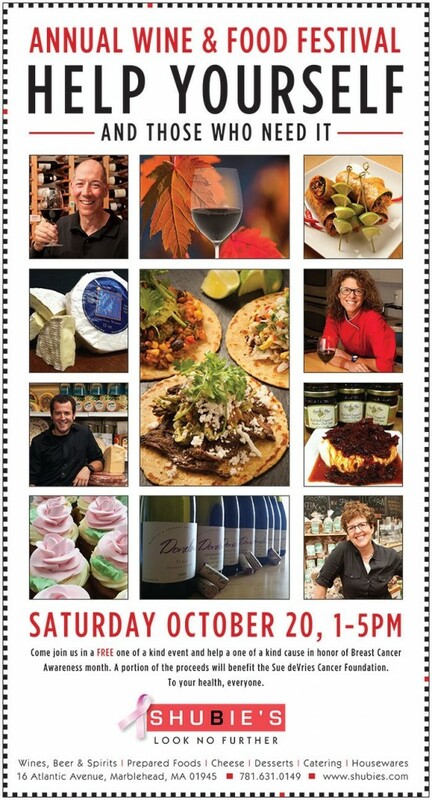 Always a great time, this year’s event features more than 20 artisan cheeses and 50 wines to taste (free). We’re happy to add that a portion of the proceeds will go to the Sue DeVries Cancer Foundation. Take the week to recover, then head over to Wine ConneXtion in North Andover on Saturday the 27th from 12:00 to 5:00 for their Third Annual Fall Grand Tasting. Taste a wide selection of new wines, peruse more than 50 hand-selected bottles from all over the world, and enjoy culinary treats from Chama Grill (free). Finally, you won’t want to miss Salem Wine Imports’ annual Grand Tasting Event at the Hawthorne Hotel on Friday November 2 from 6:00 to 9:00. Advance tickets are $25 for members of Historic New England, Historic Salem, Inc, and the Salem Athenaeum, $35 for nonmembers (all tickets are $35 on the day of the event). Enjoy wines from dozens of vendors, light refreshments, and live entertainment; all proceeds support Historic New England, Historic Salem, Inc, the Salem Athenaeum, and Hamilton Hall. Contact Salem Wine Imports at (978) 741-9463 for tickets. Along with cooler weather and strangely dressed children, there are a slew of food and drink events coming up in October, including two restaurant weeks and fests of every description. October is always the biggest month of the year for activities in Salem, and this year is no exception. For a full schedule of Halloween related events, check out their Haunted Happenings site. This Saturday, October 6th, Salem will see two tasty events to benefit great causes. At the 2nd Annual Salem Chowderfest you can sample some of the city’s best clam chowder while listening to live bands from 11:00 to 2:00. The $5 tasting fee benefits the Avon Foundation, which raises breast cancer awareness and education. At 5:00 head on over to the Boys & Girls Club for Witchtoberfest. There’s a Beer Run beforehand, or you can just spend the evening sampling beer and food and listening to live music. A portion of the proceeds go to the Boys and Girls Club of Greater Salem. Also on the 6th the Essex Shipbuilding Museum hosts Ales over ALS from noon to 5:00. Not only will it be an afternoon full of great local brews and food, but the event also features an amateur homebrewing competition, to be judged by special guests. The coolest part is that the winning beer will then be be produced by Haverhill Brewery and proceeds from the sales of the one-time release will go towards helping to develop a cure for ALS. 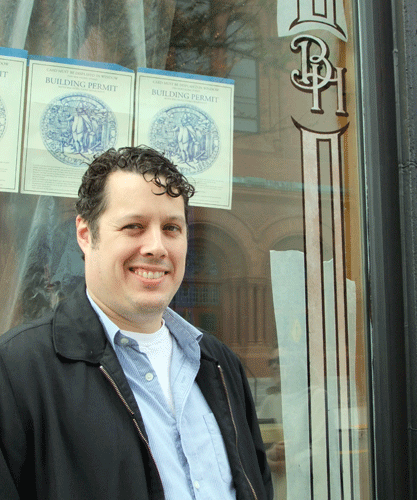 Then it’s the start of the very first Beverly Restaurant Week, on Sunday October 7. Purchase a two-course, prix-fixe dinner for $15 or a three-course dinner for $25. Participating restaurants include American BBQ, BellaMia Trattoria, Bertucci’s, Chianti, Cielito Lindo, Cygnet, Beverly Depot, EJ Cabots, Hale Street Tavern, Happy Clam Seafood Cafe, Kame, Kitty O’Sheas, Mikado, Not Your Average Joe’s, Organic Garden Cafe, and Prides Bar & Grille. Next up is a Harvest Dinner at Gloucester’s Alchemy on Thursday October 11 starting at 7:00. Co-owner Jeff Cala and head chef Scott Jensen will execute a five-course menu based on the new crop of goodies from the fall harvest, and general manager Matt Rose will test the limits of his drink repertoire to provide pairings with each course. Tickets are $100 per person and seats are limited. Call (978) 281-3997 to reserve. On Friday October 12 from 6:30 to 9:00, join fellow foodies for Tales and Ales at Newbury’s Swett-Ilsley House, which served the town as Swett’s Tavern in the late 17th century. The huge fireplace and massive beams make a great backdrop for enjoying traditional local brews from Ipswich Ale Brewery and a hearty tavern dinner while listening to true tales of sword fights, scandalous romances, and bloody brawls from Newbury’s storied past. 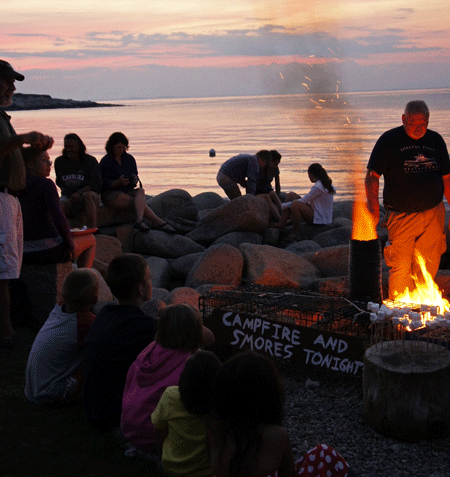 Tickets are $35 for Historic New England Members and $55 for non-members. Call (978) 462-2634 for information or purchase tickets here. There’s a Bootleg Bash Prohibition Party on Saturday October 13 from 7:00 to 10:00 at the Lynn Museum to celebrate its 115th anniversary. Enjoy an evening of Roaring ’20s entertainment with live music by the Salem Jazz Fest, cash bar and signature cocktail, raffle roulette and live auction, costume contest, photo booth, complimentary hors d’oeuvres and birthday cake, festival food to purchase, and speakeasy surprises. 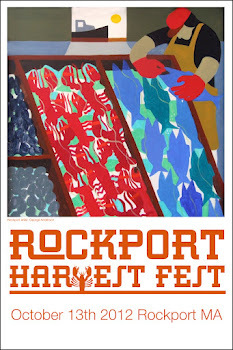 The Rockport HarvestFest is also on the 13th, from 10:00 to 6:00. Along with live music and kids activities, there’s an 11:00 cooking demonstration and a 3:00 seafood throwdown hosted by the lovely Heather Atwood. You can sample fare from local restaurants and shops, including seafood, sweets, pastries, soups, and beer. Alfalfa Farm Winery in Topsfield will be hosting their Harvest Fest on both Saturday the 13th and Sunday the 14, which includes tours of the winery and vineyards, wine tastings and live music. A Taste of Swampscott on Sunday October 14 from 1:00 to 3:30 is shaping up to be quite an event at Swampscott High School. Tickets are only $15 in advance ($20 at the door) and restaurants include The Blue Ox, Caffé Paolina, Cupcakes by NeeNee, Five Guys, Marblehead’s new Joey D’s, Red Rock Bistro, Sweet Life Confections, Terry’s Ice Cream, and many more. The ever-popular Essex Clam Fest takes place on Saturday October 20 from 11:00 to 4:00 this year at Shepard Memorial Park. The free event includes entertainment, Ipswich Ale samples, an arts and crafts area, and kid’s games. For $5, you can eat more chowder than you ever wanted and vote for your favorite. 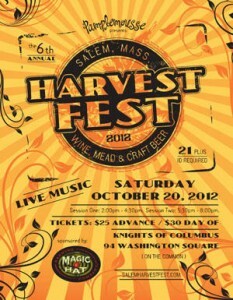 Also on the 20th is Salem Harvest Fest, from 4:30 to 8:00 at the Knights of Columbus. It features a grand tasting of wine, mead, and craft beer, including Magic Hat, Cape Ann Brewing, Cody Brewing, Harpoon, Mayflower, Narrangansett, Notch Session Beer, White Birch, Clown Shoes, Element Brewing, Ipswich/Mercury, Berkshire Brewing, Isaaks of Salem, and Sap House Meadery. Mitch Alden from Now Is Now will provide live entertainment. Tickets are $25 in advance at Pamplemousse or online, and $30 the day of the event. 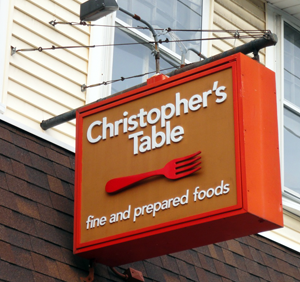 Cape Ann Restaurant Week starts on October 21, with three-course meals for either $33.12 or $25.12. Participating restaurants include Lobsta Land, The Grand Café at Emerson Inn, Alchemy, Latitude 43, Cala’s, The Landing at 7 Central, and Mile Marker One. Also that Sunday, Castle Hill on the Crane Estate is throwing a Chef’s Octoberfest. the $75 ticket promises to bring you Chef Robert Grant from The Blue Room in Cambridge creating a lush, multi-course meal using fresh local produce, accompanied by plenty of ale and music. The feast is slated to be served alfresco, though will move to the barn in the event of rain. Finally, on the Saturday the 27th, The Wine ConneXtion in North Andover will be hosting its Third Annual Fall Grand Tasting, where they will be pouring over 50 wines, which attendees can taste free of charge from 12:00 to 5:00 along with food bites from Chama Grill. There are some fantastic food events coming up in September and October, but we’re thinking drink, especially beer, takes center stage! We’ll stick to September for the moment and fill you in on October as it gets closer. In the meantime, check our calendar to see what’s coming up. 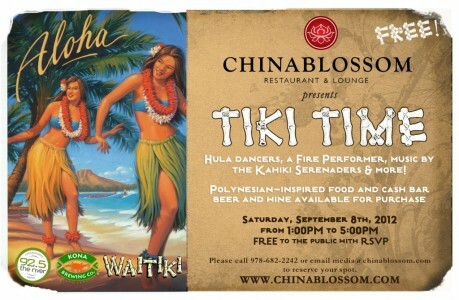 First up is a Tiki Festival on Saturday (9/8) from 1:00 to 5:00 at the China Blossom in North Andover. It’s a free event with music from 92.5 The River and complimentary samples of Big Wave Golden Ale from Kona Brewing Company. Luau-style food will be served, including a whole pig roast, beef teriyaki skewers, shrimp skewers, corn on the cob, and pork fried rice ($1 per serving). Tropical slush and exotic sorbet will also be available for purchase along with assorted juices, non-alcoholic pina coladas, and beer and wine served from an outdoor cash bar. Click the link above to RSVP and for more information. Also on Saturday is the Clown Shoes Olympics and Brewfest from 4:00 to 8:00 at the Backstage Bistro in Beverly. Tickets are $35 online and $40 at the door, with proceeds to benefits Pints for Prostate. There will be beer sampling, jugglers, human statues, live music, and beer poetry readings, plus gifts for guests wearing togas. Next weekend kicks off with a History & Hops Craft Beer Tasting at the Lynn Museum from 7:00 to 10:00 on Friday (9/14) featuring live music, craft beers, and food. Farther north, the Wenham Tea House is hosting their first Mayflower Brewery Beer Dinner at 7:00. Chef Peter Capalbo will be creatively pairing dishes with five different offerings from Mayflower. this five-course dinner is $75 per person and reservations can be made by calling 978-468-1398. On Saturday (9/15) from 12:00 to 6:00, you can attend the Ipswich Ale Harvest Fest at the Spencer Pierce-Little Farm in Newbury for beer, BBQ, and vintage baseball. The Orville Giddings band will play, and admission is free. Then you can head over to Oktoberfest to Benefit the Salem Y from 5:00 to 9:00. Join Pamplemousse, Cafe Polonia, the YMCA, and Ilsa the Angry German Beer Wench for laughter, beer, traditional German and Polish food, beer, live music, beer, wenches, contests and more. Tickets are $20 and include kazoo, mug, German Alpine hat, and an imaginary passport to Munich (first 300 guests). 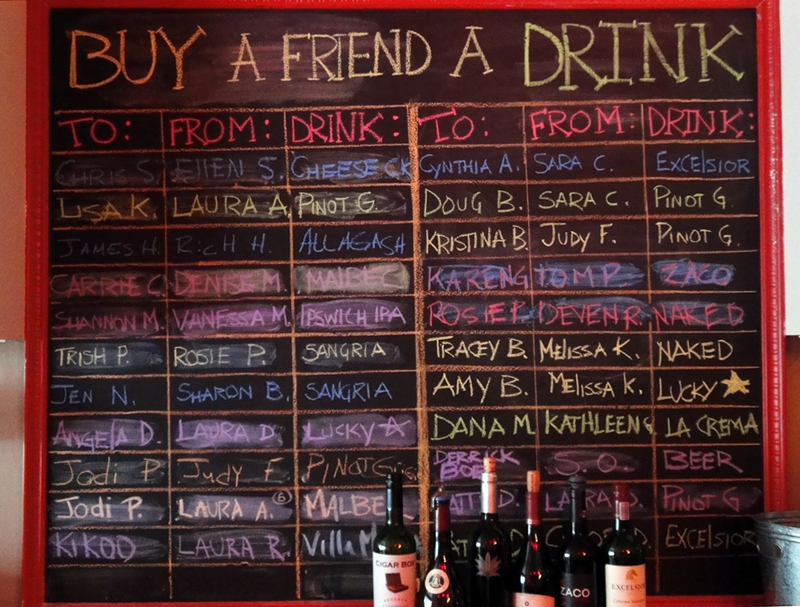 Beer sampling is included; full pours are $2 to $3. 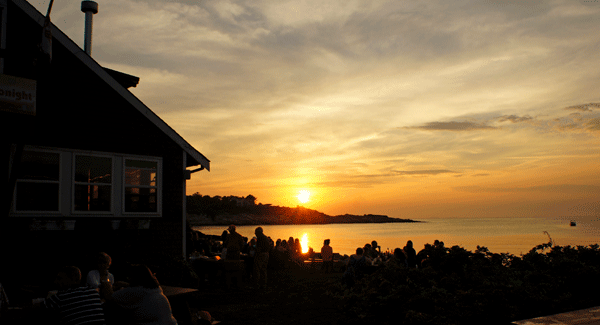 Affordable menu prices from Cafe Polonia, Polonus Deli, and The Lobster Shanty. Or head north to the Gloucester Block Party from 6:00 to 11:00 in downtown Gloucester, a free event. Main Street will be a promenade of entertainment, al fresco dining, dancing and children’s games. 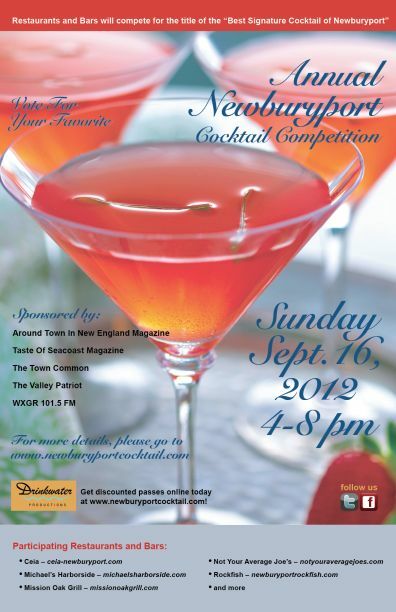 On Sunday (9/16), switch over to cocktails and head to Newburyport for the Annual Newburyport Cocktail Competition from 4:00 to 8:00. For $20 ($30 at the door), you can participate in this upscale cocktail crawl with samples of signature cocktails and food pairings at multiple downtown restaurants. Participants include Ten Center, The Rockfish, Michael’s Harborside, Ceia, and more. Check at the deck at Michael’s Harborside at 4:00. At 7:00, the wrap-up party at Michael’s will feature live music and the last signature cocktail for your tasting. Next up is Cider Hill Farm’s End of Summer Farm-to-Table Dinner on Tuesday (9/18) from 6:00 to 9:00. Sample spirits from Cody Brewing and Jewell Towne Vineyard along with appetizers, then enjoy a three-course meal from Amesbury’s Phat Cat’s Bistro. Tickets are $50 and must be purchased in advance. 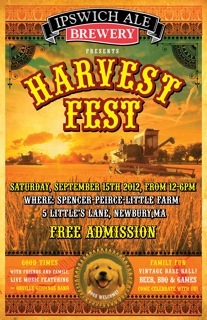 On Saturday the 22nd from 12:00 to 8:00, it’s the 6th Annual Brewfest at Amesbury Sports Park. Entrance is $12, with more than 100 beers, OGO ball, summer tubing, and BBQ on offer. The 22nd is also the start of the 3rd Annual North Shore Beer Week. While Sean and Ian (The infamous 2 Beer Guys) haven’t posted the full schedule yet, keep an eye out. They’ve done a terrific job the past two years scheduling tastings and events, and we’re sure this will be no exception. Would you like to have a gourmet picnic with 650 like-minded people in an undisclosed location? This was the offer extended to us a few months ago as the highly secretive Diner en Blanc prepared for its first Boston event. This was definitely worth leaving the north shore to experience. 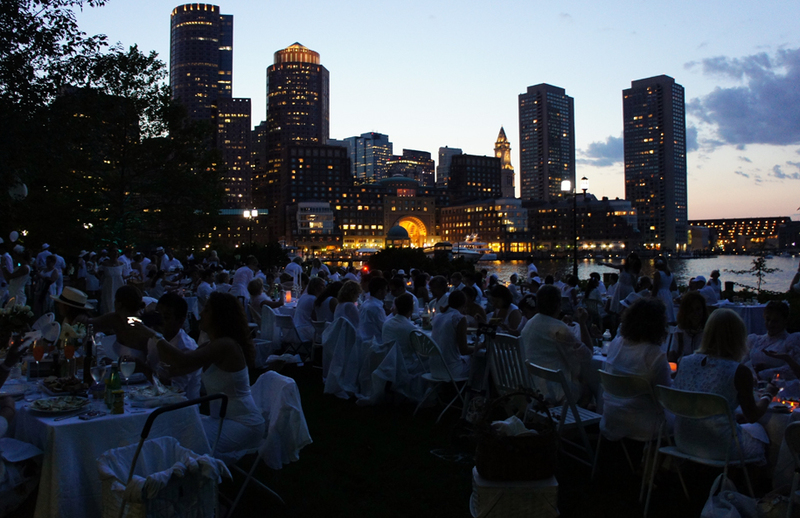 Started in Paris in 1988, Diner en Blanc is a chic mass picnic in a public space. It’s by invitation only and involves some preparation on the part of the attendees, but the Boston event last night came together beautifully on the lawn in front of the Moakley Courthouse. After dressing all in white, putting together a gourmet picnic, and gathering a portable table and chairs, we met our leader at our designated location on Seaport Blvd. We were soon surrounded by elegantly dressed picnickers, and when our group was complete, we were instructed to walk toward the courthouse. It was a large crowd, but the tables were set up quickly, and a bar and band awaited the group. Between the view of Boston Harbor and the skyline, the white-clothed tables and party-goers, and some strategic lighting, it was a magical sight. We thoroughly enjoyed talking and sharing bites with our tablemates, who included North Shore residents Deborah of Melu Tasty Treats, one of the amazing volunteers, and Cathyann of Cygnet Confections, who wowed everyone with her lucious cake. 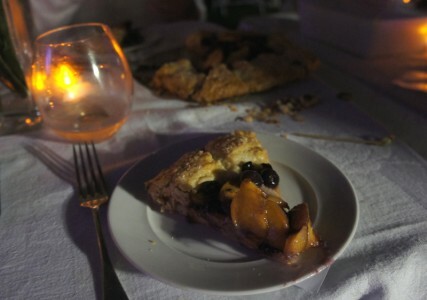 We also enjoyed smoked salmon pate, a creamy quiche with an herbed crust, and a terrific peach blueberry tart with almond paste (recipe from Annie Copps via the lovely Heather Atwood). If you’re intrigued by our report, keep your eye on the Diner en Blanc website, where information on future events will be posted. The idea is to grow the event each time it’s held, so there’s plenty of opportunity to snag an invite for next year, which organizers are already discussing given last night’s resounding success.